Minimal duplication, if any at all. 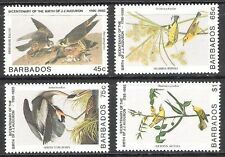 Barbados Off Paper selection, Some fine looking stamps included. Ref-871. 43 Vintage Barbados stamps priced to clear stock P81. 41 Barbados vintage stamps priced to clear stock P77. Dispatched with Royal Mail 2nd Class Letter. Barbados, Scott 773 - 776 in MNH condition, as shown in the scan(s). Barbados, Scott 973 - 976 in MNH condition, as shown in the scan(s). Barbados, Scott 1063 - 1066 in MNH condition, as shown in the scan(s). Barbados, Scott 1067 - 1070 in MNH condition, as shown in the scan(s). B/TB : Beau/Très Beau : timbre de bonne qualité et de bel aspect présentant un défaut (mince, pli, etc). Pour leurs calculs, nous appliquons les règles suivantes Envoi recommandé pour commande de plus de usd50. 40 Barbados Stamps priced to clear P69. Barbados, Scott 752 in MNH condition, as shown in the scan(s). Barbados, Scott 1047 - 1050a in MNH condition, as shown in the scan(s). 43 Vintage Barbados stamps priced to clear stock P80. Barbados, Scott 934 - 935 sheetlet in MNH condition, as shown in the scan(s). Barbados, Scott 1036 - 1042 in MNH condition, as shown in the scan(s). Barbados, Scott 1058 - 1062 in MNH condition, as shown in the scan(s). Barbados, Scott 777 - 783 in MNH condition, as shown in the scan(s). Barbados, Scott 891 - 895 in MNH condition, as shown in the scan(s). Barbados, Scott 896 - 900 in MNH condition, as shown in the scan(s). Lot of 109 Barbados Assorted MNH Mint Never Hinged Stamps. Barbados, Scott 753 - 768 in MH condition, as shown in the scan(s). 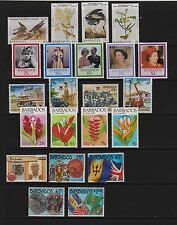 Lot of 48 Barbados Assorted Used Stamps. Barbados #1010-3 mint never hinged set. I do it this way so I do not have to keep up with that. One less thing to worry about. Most of my pictures are enlarged to show more details. You may or may not get the one pictured, but the one you get will be as nice if not nicer than the one pictured. 45 Vintage Barbados stamps priced to clear stock P72. Dispatched with Royal Mail 2nd Class Large Letter. Barbados, Scott J1 - J3 in Used condition, as shown in the scan(s). And, if old US coins intrigue you, take a look. I'm starting to add a few 100 year old coins also! Barbados 235 - 247 VF MH. Barbados Scott # 235 - 247. Don't miss this one, scarce, good value here. Major faults are listed above. Very-Fine Condition & Centering. Mint Never Hinged. Issued 2000. SCOTT #982-995. BARBADOS #467-469, 1977, ROYAL VISIT, MNH, SET/3 PARTIAL SHEETS/15, NICE! LOOK! Very-Fine Condition & Centering. Mint Never Hinged. Issued 2005. This listing is for twenty-seven full sheets of twenty-five 1¢ 1970 Lion at Gun Hill Barbados stamps! Please see our detailed photos for best assessment, and feel free to ask any questions you may have before making your purchase. Serving the Collector & Investor by a Collector for Over 40 Years! for any item found to be NOT GENUINE. Obtaining Certificates of Authenticity. NO EXCEPTIONS. Any item not specified should be considered hinged. The Animal-Drawn Tram. with 23 kt gold replica stamp. More from ennairam. Barbados Scott# 396 - 411, complete mint set, post office fresh, very well centered, original gum, Never Hinged, VF. 2019 Scott catalog value $51.70 US. BARBADOS 1972-74 $5 WITH INVERTED WATERMARK SG 467w MNH.